Evan Davis: As you've heard, China's National People's Congress has just finished its annual sitting. It is the world's biggest parliament, has almost 3,000 members and tends to meet a couple of weeks a year. This year Chinese Premier Wen Jiabao closed the congress with a press conference where he made some rather interesting comments about stepping up economic and political reforms to spread wealth wider. He also said that Beijing would allow the currency the yuan to float more freely. 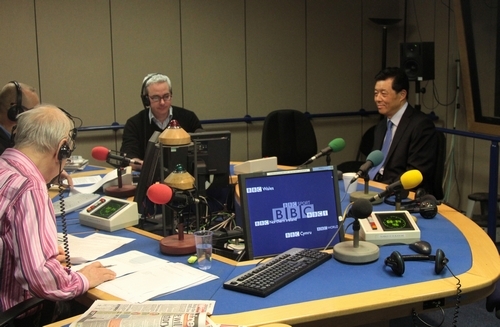 With us in this studio, I am pleased to say we have the Chinese Ambassador to the UK, Mr Liu Xiaoming. A very good morning to you! Ambassador Liu Xiaoming: Good morning! 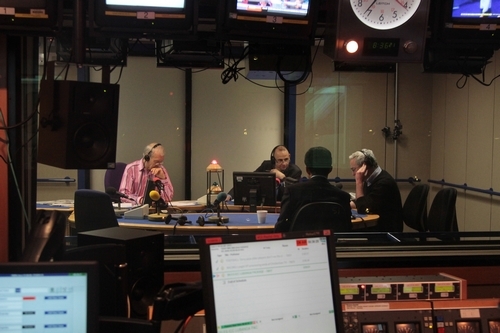 Evan Davis: Thank you for coming in. Can we talk about democracy? Do you think China is on a path to more western style democracy with more open elections, freer elections? I mean the parliament doesn't actually have any elections at the moment, does it? Ambassador Liu Xiaoming: Yes, very much so. But I think that's Chinese democracy, democracy with Chinese characteristics. I think many people focus on what Premier Wen has said about political reform. But Premier Wen basically reiterated the position of the Chinese government with regard to political reform. You know, for the past 30 years, China has engaged in reform and opening-up, but many people outside only pay attention to economic reform. In fact this reform is all-round reform. It is not only about economics, but also about political reform. Evan Davis: How far can it go, do you think? 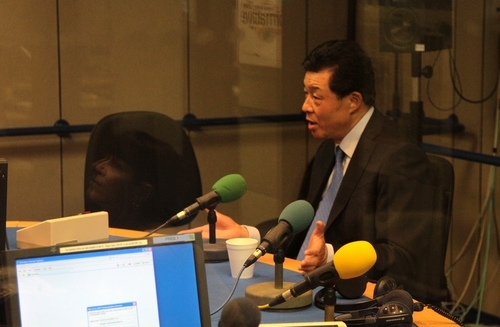 Ambassador Liu Xiaoming: I think China has come a long way, if we compare China today with China 30 years ago. When Mr. Deng Xiaoping started this reform and opening-up, one of the top priorities on his agenda was political reform. We abolished the life-time tenure of the leadership. Before Deng Xiaoping, all Chinese leaders served in their position for their life time. Evan Davis: Like a monarch. Ambassador Liu Xiaoming: You know, China had been ruled by emperors for thousands of years. It was not until after the founding of the People's Republic that we adopted what we call socialist democracy system. But it is not perfect. So it is always on the road of practicing, searching for new methods, how to make our system more effective, more accountable, more democratic. But if you look at China today, it is quite changed, what we call "tremendous transformation." Both President Hu and Premier Wen will finish their two terms of tenure. Evan Davis: They will leave. They will go. Ambassador Liu Xiaoming: Yes, they will leave. There will be smooth, orderly transition from previous leadership to the new leadership. Evan Davis: But there are people in China, who perhaps are a little more middle-class, a little more affluent than they were a generation ago. Do you think they will like a little more say in the way the country is run? We had commune rebellion against bad actions of their leaders. People are beginning to say, " Look, we don't want to be bossed around and we're not going to be told. We like to have some say." Do you think you can deliver that to the public on this gradual path that, as you said, has been changing already, without great crisis, rupture, or social disruption? Ambassador Liu Xiaoming: I would say political reform is already an ongoing process. No system is perfect. We have made tremendous progress and achievements, but there is still a lot of room to improve. I think the government has made a lot of efforts on how to make the government, both central and local, more accountable to the people and how to fight corruption, how to make people have access to information. For instance, the recent National People's Congress you mentioned has reformed the way people elect their deputies. In the past, the cities had more deputies than the countryside. Now we have it more evenly, more balanced. So, people will have their equal voice. Evan Davis: Now tell me this. Do you listen to Today programme in your role as Ambassador? Evan Davis: What do you think when you hear my colleagues sitting next to me here berating a politician or interviewing him very toughly? Do you think that is a good thing or a bad thing? Ambassador Liu Xiaoming: It might not be a bad thing. That is a different culture. In fact I find it very interesting. I find Chinese people, Asians in general show more respect to their leaders than the Western public. I am still trying to find out the answer, whether your politicians did a good job or maybe Chinese leaders and Asian state leaders have done a better job. But, they earned more respect from their public. Evan Davis: There are so many things we can talk about, because, there is Syria, there is North Korea. Your were based in North Korea, I think. Ambassador Liu Xiaoming: Yes, for three and a half years. Evan Davis: I just want to ask you about North Korea, but I know I should talk to you about Syria. When is China going to-- because it is all down to China. North Korea is a camp where 25 million people have been held hostage, more or less, by a mad family. When is China going to pull the plug on that and just say, "Look, enough is enough. We need reform in North Korea as well. " Ambassador Liu Xiaoming: We see North Korea as our close neighbour. We certainly would like to see North Korea enjoy prosperity and economic development. And stability is our top priority. So we want to have good relations with North Korea. We believe North Korean people deserve a better future. So we think the best way to ensure stability in the Korean peninsula is to engage with them, rather than isolate them. That is why China engage very actively with what we call the DPRK. Now they have a new leader. We believe that he should be given the opportunity to carry on his duty. It seems to me there are good signs since the coming of the new leadership. The United States and North Korea reached agreement on the nuclear programme, and on aid programme. We believe that if all countries work together, we will have a better future for the Korean peninsula. Ambassador Liu Xiaoming: We think reform can only be effective from inside. I don't think it will work if we impose any outside model or policies. We encourage them. So that is why we invite their leaders to visit China to see for their own eyes what changes reform has brought to China. But we don't think it is a good thing to impose. You know, China has always followed the principle of non-interference in the internal affairs of other people. We believe it is up to the people to decide the future of their respective countries. Evan Davis: We could talk for ages. Ambassador, we know now you listen to the Today programme. We can get you on and grill you again on many issues. Liu Xiaoming, thank you very much for coming in. Ambassador Liu Xiaoming: Thank you for having me.